A Refreshing New Take on Golf. Golf Peaks may as well be the most unique golf game released in recent memory, as it’s not entirely a golf game. Instead, it uses a card-based system to move the ball to the end flag. Not only is the gameplay itself well executed, but the presentation is minimalistic and the soundtrack is relaxing and soothing. Poland indie developer Afterburn initially launched their first game, Golf Peaks onto mobile devices and PC in November of 2018. A few months later, Golf Peaks released onto the Nintendo Switch, with all the content from the previous versions. The transition to consoles is well done, thanks to the simple control scheme. Golf Peaks is both a sports game and a strategy game. Your goal is simple, hit the ball to the flagpole. The way you do this however, involves hitting the ball with action cards that have different numbers on them, indicating the amount of spaces the ball will move. The player needs to think on the best route to the goal using the cards given to them. There’s a total of nine worlds, each with twelve levels each, summing up a grand total of one-hundred and nine levels in the game. Each level is short, taking around half a minute to five minutes at most to complete. 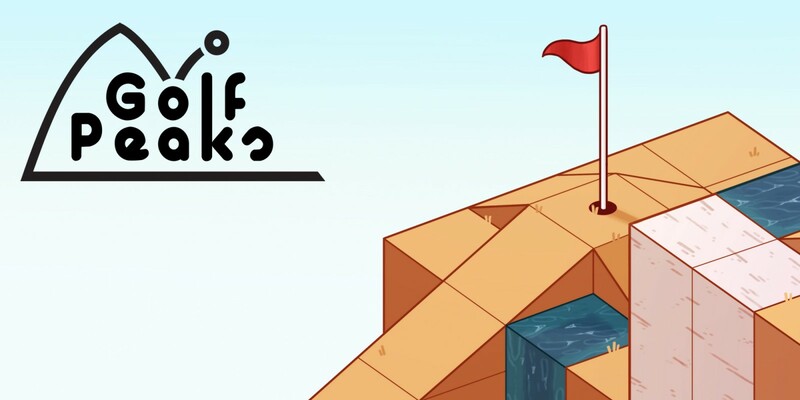 Players only need to finish the first nine levels to go to the next world, with three of them being optional, harder puzzles. Each world introduces a new gimmick to the gameplay, like ice blocks that cause the ball slide to the next few tiles, mud that stops the ball in place, spring pads that launch the ball upwards, moving rails that pushes the ball to the direction it’s moving at, alongside a few others. The new mechanics keep things fresh and prevent it from getting stiff or repetitive. As for the movement options, there’s three types of action cards. The first one is a directional card that lets the player move a certain amount of spaces from one to nine, depending on the number displayed on it. The second is a jump card that lets players hover through a number of tiles, again depending on the number shown. There’s also a third card that mixes both movement and jump actions into one. The levels themselves develop over time and get more complex with each passing stage. The last few levels in each world bring some challenge to the table, although none took me over five minutes to accomplish. The overall difficulty ranges from easy to medium, with only a handful being considered “hard”. As for the total runtime, I managed to complete the main levels within an hour and a half, and added an extra half an hour beating the hard ones. Finishing the game 100% and seeing everything it had to offer took me a bit over two hours, which unfortunately isn’t all that much. The game’s visual presentation is simplistic yet surprisingly beautiful, in a way that it looks clean and all the tiles and objects stand out from one another. Both the background and levels themselves have light colours, which help out with the relaxing theme the game is thriving for. The soundtrack works wonders! It’s very relaxing to hear, left me feeling calm, and I just couldn’t get enough of it. The music is acoustic, with soothing melodies that made me feel very sleepy. A small but questionable issue is the lack of a main menu or title screen. The game’s logo is cramped into the upper left-hand side of the level selection screen, with the bottom left corner containing the options menu and the credits, whereas the right-hand side features a level select screen. This minor issue doesn’t affect the overall experience and is more of a nitpick than anything, but I still would’ve liked a less packed user interface. There’s a lot of things Golf Peaks does right. It innovates the gameplay formula most golf games have by utilizing a strategy-based card system. Not only that, but each new world integrates a new gimmick that keeps the game from ever feeling the same. The visual presentation and soundtrack work great with the gameplay, giving off a relaxing, mind-soothing vibe. The total runtime is on the short side, but it can be justified with its $5 USD price point. If you’re looking for a great puzzle game, a relaxing experience or a cheap title you can soak a few hours into; Golf Peaks is definitively for you. You can’t go wrong with picking this game up.